Vail is known for skiing and snow sports, but it is just as fun in the Summertime when you can enjoy activities that are not available in winter. It also has a totally different ambiance in the Summer and you can enjoy the warmth of the sun while cycling along the river, head to the new Epic Discovery center for mountaintop activities, or go for a picnic hike with a llama. This is the kind of place that feels like an escape from the world, nestled comfortably in the mountains. You do not necessarily need a car in Vail as it is extremely walkable and there is free public transportation by bus. You can access the town via Colorado Mountain Express shuttle service from Denver International Airport. Here are six wonderful things to experience in Vail during Summertime. Situated on Gore River, The Westin Riverfront is a four diamond resort that offers luxury and entertainment for family members of all ages. With the Kid’s Club providing activities for children 5-12, a decadent spa for adults, satisfying restaurant, and a prime location for enjoying the area’s outdoor activities, this property is a solid choice for accommodations. Larger families and groups can stay in spacious suites. Bedrooms are large, with crisp modern decor and comfy bedding, while living rooms are cozy with a fireplace and balcony. There are washer/dryers which are convenient especially when traveling with children. Suites offer full kitchens decked out with everything you need to prepare and meals, like Cuisinart pots, pans, baking dishes and appliances like a toaster and blender—the works—is practical and homey. There is a large dining table for dining (and playing board games), and bar stools at the sparkly granite counter. Just up the road is a grocery store for supplies. The Westin has a luxury SUV available to guests for 2 hour increments which is handy for grabbing groceries and seeing nearby sights. But you won’t want to cook all meals yourself because the hotel’s restaurant, Maya, is fabulous. Specializing in over 100 agave-based spirits, Richard Sandoval’s Maya Modern Mexican Kitchen & Tequileria is the place to enjoy a craft margarita, like Tamarind or Watermelon while sitting at the fire pit outside enjoying views. The food is also creative and flavorful. You will find dishes like Wild Mushroom Enchiladas, Caramelized Plantains, and varieties of Guacamole prepared table-side. Maya is an experience to be savored. Between the salt water pool with dedicated lap lanes, the bike/running/walking path that runs along the river, and all the available activities nearby, you will have plenty of opportunities to work up an appetite. Spa Anjali is where you go to unwind. Three different “journeys” from Rocky Mountains, Alps, and Himalayas offer healing benefits from each theme. The Wildflower Polish is especially appropriate for a Summertime spa treatment in the Colorado Rockies. Beginning with a scrub made from wildflowers and ending with a massage using Spa Anjali’s signature body butter, it soothes parched skin and relaxes achy muscles. For accommodations in Vail Village, The Sebastian is a charming option and Vail’s newest boutique resort and residence club, having opened its doors in 2011 as part of the Preferred Hotels & Resorts collection and Timbers Resorts. The Sebastian is perfectly situated for easy access to Vail Village immediately out the front door. This hotel wins you over when you first drive up and see the twinkling lights at the entrance signaling that this is a place to feel festive. They keep the lights up and glowing year round, so even while visiting in Summertime, you feel the spirit of celebration. Rooms are available in many sizes and configurations from intimate rooms for couples to extra large accommodations for large groups and families offering separate bedrooms, living rooms with cozy fire places, balconies, fully stocked kitchens and washer/dryers. You have everything you need for a comfortable stay. Supplies are easy access, with a cute little Italian Deli and spirits shop next door to the hotel, and a grocery store nearby. At night the pool is illuminated with trees covered in twinkle lights. Blue tiles sparkle and you can relax in one of four hot tubs while staring up at the stars. During the day, it’s a great place to get your second wind with a quick dip and food and beverage service. For cocktails, head to the hotel’s lounge, Frost, for their Mojito bar. Frost specializes in craft Mojitos and even has their own Mojito Garden with several varieties of mint grown to enhance various drinks such as Watermelon, Peach, and Blackberry Mojitos. Frost also offers the largest Tequila selection in Vail. The atmosphere ranges from mellow to hopping, depending on when you go. Leonora, the hotel’s restaurant, offers excellent breakfast options like Eggs Benedict on Ciabata with Sautéed Vegetables, Huevos Rancheros, and Pancakes as well as a Fresh Juice of the Day. Leonora will also create customized picnics for mountain picnics or to enjoy while watching outdoor concerts. The Sebastian offers bicycles via Sebastian-Vail Base Camp, and it is a true luxury to have them the whole time you are there, just waiting for you outside in the bike racks at the entrance. Vail is an incredibly bike friendly destination and the trails that run through town are moderate, so you don’t have to be an athlete to enjoy cycling. For the more advanced, mountain biking is available as well. A complimentary BMW car service will take you to nearby destinations and the staff at The Sebastian is exceptional. 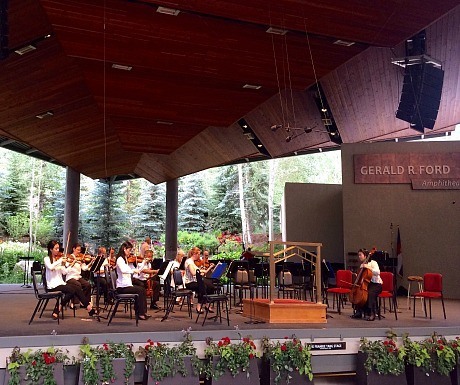 This six week music festival boasts world famous classical musicians and is the only North American festival to present three top orchestras in one season. The Dallas Symphony Orchestra, The Philadelphia Orchestra, the New York Philharmonic and London’s Academy of St. Martin in the Field are among the 2016 line up. There is seating in the covered pavilion, and on the lawn. People bring blankets and food and there are concessions on site as well. If you are staying at The Sebastian Hotel, be sure to ask for a picnic to take along to enjoy with the music. Vail Resorts’ new Epic Discovery program aims to foster environmental stewardship through a variety of exciting activities for both children and adults. You ride the Gondola to the mountaintop, and after taking in the sweeping views, you can choose from several actives like Zip Lining, Bungee Trampoline, and the alpine roller coaster called Forest Flyer. Located on the creek, Mountain Standard offers excellent fine dining with a rustic casual atmosphere and wonderful views. Though relatively new, it’s become a Vail classic with delicious food prepared over an open wood fire. The result is earthy flavor and deeply satisfying dishes. From appetizers like Smoked Olives and Bruschetta, entrees like Alaskan Halibut, and wildly fabulous desserts like homemade ice-cream with meringue and fresh berries, each dish is a delight. Each Sunday during Summertime, there is a Vail Farmers’ Market and Art Show throughout Vail Village. Over 40 venders offer local art, food and crafts. You will find local treasures like Colorado landscapes, jewelry, pottery, hand crafted body care products, delicious Mexican food (Maya has a booth there), artisan baked goods and healthy options like fresh pressed organic juices from Green Elephant Juicery.